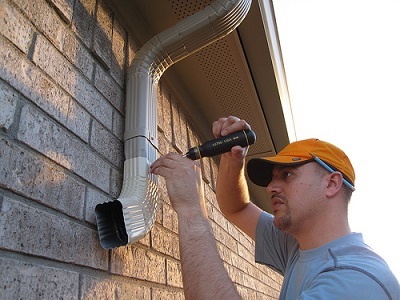 One of the most important and often ignored parts of your home is the gutter system. This is an essential safety feature of your home as it collects the rainwater and safely directs it down to the ground, away from the foundation of the house. Despite the fact that gutters play an important role, most homeowners fail to pay attention to their health. Just like other parts of your home, rain gutter also deteriorate over time due to the changing weather or a lack of routine maintenance. When the gutter system of your home fails, it becomes necessary to repair or replace it. Unlike other projects, gutter installation is not a DIY job because it’s a very complex process that demands time and proper skills. For this reason, it becomes necessary to hire a professional to install or repair your gutter system. If you’re facing any issue with your rain gutter, here are some important tips to keep in mind as you begin the rain gutter installation process. You need to consider the material to be used for your rain gutter system. You can select the material according to your budget and needs. You will find numerous materials for rain gutters on the market and each material has its own benefits and downsides. For a perfect rain gutter installation, the most commonly used materials are galvanized steel, copper, aluminium, and stainless steel. Both stainless steel and copper are durable and don’t rust, but these materials are expensive. Aluminium is the most popular option because of its durability and lightweight. Once you choose the right material, compile a list of everything you will need to complete the job. Another important consideration is the size of the rain gutter that needs to be calculated according to your city’s rainfall intensity. To determine the right size of the gutter, find out the square footage and slope of your roof. You can do this easily by using an online gutter-sizing calculator or consulting a gutter installation professional. In addition to this, you’ll also need to determine the position of your downspout. When you think of accessories, you might think of fancy items used for making rain gutter look attractive. But in reality, accessories play various important roles. You can invest in accessories that are used for preventing gutter clogs that are caused by leaves and debris. In addition to this, rain chains are quite useful as downspouts. No doubt proper installation of rain gutter is crucial but maintaining it is equally important. To extend the life of your gutter system, you need to keep it free from clogs, leaky joints, flooding, and other water damages. However, if your system is not installed properly, you’ll end up spending more money on repairing costs. Make sure, it is properly sloped toward the downspout at an angle of 1/4-in to eliminate water. 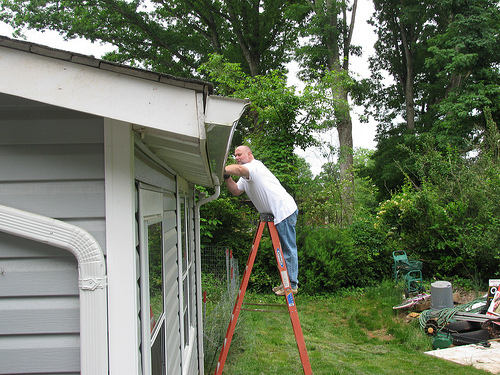 Moreover, it’s necessary to apply a sufficient amount of sealant inside the gutters. While installing a new gutter system, you might find it a little confusing to settle down on an option that seems to be best suited to your preferences. There are gutter systems made out of vinyl, steel, aluminum, copper, and other such materials. All these materials are made for the purpose of accommodating specialized needs of each household. Before you select any particular material, make sure that you look up their utility and functionality. Amongst all these, the aluminum variant is probably the most universal one. Listed below are some of the advantages of aluminum gutters. Aluminum gutters are the most widely sold and bought in the market. This universality is justified by their tenaciousness and extreme durability, and they can be used for commercial, industrial, and residential units. Aluminum gutter unit also happen to be very low-maintenance in comparison to other materials. Given that steel gutters are tougher than aluminum ones, the downside of this material is its heavy weight. Additionally, over time, the accumulation of leaves and debris will start corroding your steel gutter system and eventually rust over large areas, weakening the capacity of these units. Aluminum gutter units have an advantage over this drawback as they do not rust and are much lighter than the steel counterpart. Aluminum gutter are customizable to your requirements. They are available in varying gauges and thickness, thereby giving you the provision of tailoring it to match the needs of your home and the surrounding climatic conditions. 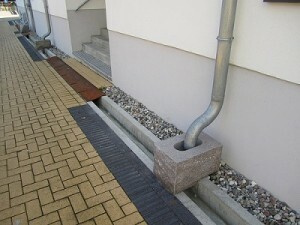 This would further ensure that the gutter systems can fit all types of spaces on the roof or on the side of your house. Owing to their flexibility, aluminum gutter units can be made to fit odd angles and shapes as well, which is nearly impossible if you happen to use copper or steel gutters. The majority of homeowners have a proclivity for aluminum gutter systems in the context of seamless gutters. Aluminum works wonders to provide a seamless fit and guarantee minimal to no leaks at all. This helps in the conservation of water, also ensuring that the gutter unit abides by the safety regulations. The advantages of seamless gutters include the complete evasion of unprompted leaks, spillage, and breaks which further eliminate risks of foundation damage, basement flooding, mold and mildew, and soffit and fascia rot. Aluminum happens to be extremely durable. They are withstanding of both mild and abrasive weather conditions, including snow and hail. Moreover, they do not lose their thickness over time. These factors are important determinants of the longevity of aluminum gutter units, many of which last for decades on end. Unlike steel and copper units, aluminum gutter systems do not necessitate soldering of joints when being installed. They also hold out against thermal expansion. Aluminum gutters are available in a wide spectrum of colors and designs to make it easier for you to choose one matching the aesthetics and décor of your house. They maintain their color well over time and are not susceptible to bleaching which is consequential to overexposure to the sun. If you are on the lookout for premium-quality aluminum gutters are at competitive market prices, you can rely on Century Aluminum, active in the GTA area, for a hassle-free experience in installing your gutters. Gutters might seem like an unnecessary and sometimes dated addition to a house. However, the truth is that if many houses do not have gutters or have ones that are not properly constructed, a few issues could arise. Examples of these include poor drainage of water from the roof which could lead to degeneration of the roof as well as the wall and in some cases the fountain. Installing gutters properly and making sure that they are properly maintained will easily help you avoid this headache. The area around your house should slope away from it. In some countries, this is a legal requirement, but in most parts of the world, it is not specified in the building codes. Either way, you should ensure that your home has a gradient slope such as a drop of six inches in vertical height for every ten feet of horizontal length. This serves the purpose of moving the water away from the house once it comes out of the other end of the gutter. It also reduces the chances of rain water accumulating around the house, which include formation of puddles of standing water around the home which could become an environment suited to some disease-spreading insects such as mosquitoes. The pools also make your compound look less attractive, and could damage the lawn in the long term. You can create trenches to guide water to designated areas. These could be lined with concrete and then covered, so that they conduct water without being visible. You might need to be a contractor in order to get this right. One of the benefits of using trenches is that it allows you to direct the flow of water according to your needs. For instance, if you have a specific location where the water can be collected, you can design the trenches to all lead here. When trenches are properly designed, they may be designed to be invisible, reducing the risk of damage to a pristine lawn or compound. A French drain can be thought of as an addition to the trench designed above. It is a pipe that has perfectly fits into the drain. The pipe has a series of holes along its length. The pipe and trench are surrounded by sand or gravel. The purpose of the French drain is to reduce some of the negative effects of a keyboard, including water runoff damage and erosion. Otherwise, they perform just as well as a normal trench. The best time to clean out gutters and eavestroughs is during the fall. This is when you have the chance to check if your gutters are in good working condition and if they have holes in them. We are not the only ones who get busy during the fall season. Bees and wasps tend to be very active during the fall season and they like to build their nests in the gutters and eavestroughs where there’s usually no much activity. For someone allergic to bee and wasp stings, cleaning out gutters during fall can prove to be a challenging activity. You should always inspect your gutters for paper comb structures to see if bees and wasps are nesting before you undertake any maintenance routines on your gutter. There are ways to keep bees and wasps from nesting in your gutters and at the same time keep leaves and debris from accumulating. This article will highlight ways you can handle bees as you clean out you gutters without putting yourself in harm’s way. 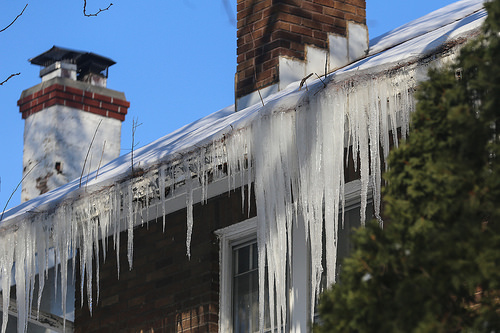 Can Eavestroughs Cause Rooftop Ice Dams? Before we get started, what is an ice dam? Well, it is the frozen ice that forms the length of the eaves of a house during the winter season. When ice dams get bigger, they impede the free flow of melting snow and rain water from the roof. The resultant water accumulation then forms a small lake at the rooftop, and thereafter starts to seep underneath the concrete, cedar, asphalt tiles. Tackling a continuing ice dam issue is both a costly, dangerous and frustrating task. This is because rooftop ice causes water leaks and roofing damage. Accumulated ice is quite dangerous for people that find themselves unlucky enough to be standing under the roof when iceberg calves off of the main rooftop glacier and falls to the ground. This is one of the main reasons people are always tearing off eaves-troughs in disgust. They actually do so thinking that they are the cause of the entire problem. Unfortunately, removing an eavestrough in Mississauga due to ice accumulation does not eliminate the problem as dangerous quantities of ice will still build up. The real cause of rooftop ice accumulation goes deeper and costs the homeowner more to rectify. Ice dams form when warm roof surfaces forces the snow at the rooftop to melt, even when outdoor temperature is to some extent below the freezing point. The source of the heat warming the roof’s surfaces comes from inside the house. However, the eaves of the roof are basically colder as they do not have a warm source of heat from underneath. As a result, when the melted warm water hits the cold eaves, it instantly freezes to form what is commonly referred to as ice ridges. The ridges continue to build up, ending up trapping and freezing water from the roof on its way down to the ground. This leads to the formation of ice dams. The trapped water above the ice dams then slowly starts to seep beneath the shingles. What are the best ways to remove ice dams from your eaves? All buildings in the colder regions of the country have high-resistance electrical heating systems in form of cables are specifically made for melting ice dams along the eaves. These cables are designed to zigzag the length of the eaves. These cables are connected to a home’s electrical mains and can be either switched on or off manually or by a thermostat. These cables are quite easy to install, even easier than eave’s membrane, and do not look as conspicuous, particularly against a tile or cedar roof. The main disadvantage with this type of a roof-heating system is that it consumes a lot of electric power, leading to increased energy bills. One of the best ways to solve ice dam issues at your home is to fasten continuos sheet of metal, asphalt or rubber roofing material above the lowest eight or ten courses of singles the length of the eaves. To properly shed water, a water-resistant material must be tucked beneath the topmost course of the shingles, but slightly above it. Although this fix will not stop the formation of ice dams, it will stop standing melted water from finding it ways in-between courses of shingles. Unfortunately, the additional waterproof coating is hard to hide, meaning that it is not ideal where aesthetics are a consideration. While this is the definitive solution to ice dam issues, it is the hardest to accomplish. Keeping the roof’s surface cold uniformly is easier said than done. Properly insulating the attic, and at the same time increasing ventilation forms the foundation to this solution. Apart from significantly reducing your heating expenses, this also lengthens the lifespan of the shingles. The best way to determine the presence of rot in wooden fascia and soffits is to use a sharp probe, screwdriver or awl. If your preferred tool penetrates the wood with little or no resistance, then this means that the wood is already rotten. Covering rotten wood with aluminum or vinyl is not a good idea as the rot will simply continue to spread. The new material unfortunately might end up expediting the process by limiting air circulation. As a result, this kind of a rot may eventually spread to the roof framing beneath, something that will end up causing a more costly revamp. If any decay is found, the affected boards must immediately be removed and the framing underneath examined to see if it is still sound. How does the rot come about? Soffit and fascia damage is basically caused by intrusive water. This causes the wood to slowly by slowly rot. Here is how it happens. • Ideally when rain comes, your roof acts as a perfect system to direct rain water from the top of the roof to the ground, and all this without water into the house. How does this happen? The rains hits the roof, or shingles, then goes down the slope and into the gutters, and then through the downspout to the ground safely away from the house. Unfortunately, some residue is left on the edge of the shingles which eventually drips down and get behind the gutter and the rest on the soffit. With passage of time, this causes the soffit and fascia to develop wood rot. Newer homes use a drip edge to protect this from happening. 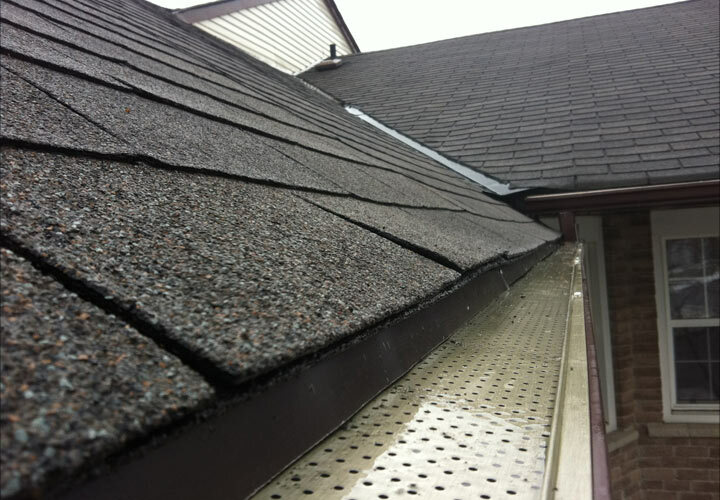 The drip edge acts as an excellent barrier that redirects the stray drips of water into the gutter. So, drip edges are one of the best ways to maintaining your home. However, these edges are often damaged or missing on older homes. • Holes in the box gutters. Different from regular gutters in that the flashing leads directly into the gutter, they easily develop holes that eventually lead to wood damage. If the existing wood is in good shape, then it is safe to cover it with aluminum or vinyl material. The original soffits might have vents cut into the surface to provide fresh air to the attic. These form an integral part of ventilation of the attic. Most vinyl and aluminum soffit material has integral venting built into the design, and hence making sure that the material underneath has sufficient circulation is something of a paramount importance. This not only improves the conditions in the attic, but it also reduces the likelihood of rot in old soffits. In simple terms, it is not necessary to remove the old soffits as long as they are in good shape and proper allowance is made for air circulation and ventilation. All in all, if you spot damage to your soffit and fascia in Toronto, make sure to have the rotted portion removed before covering it with either vinyl or aluminum. Removing the rotted section early enough can save you a lot of hassles and money in the long run. Avoid Potential Dangers With These Gutter Cleaning Tips! • Dizziness or vertigo: A lot of people are suddenly overtaken by dizziness when working at high heights. • Contact with electrical wiring: If you are not careful, you could end up accidentally hitting the overhead electrical wires with the ladder, or worst, grabbing overhead live wires while attempting to prevent a fall. • Instability of the ladder being used: This is often caused by an insecure positioning on the gutter or due to placing the ladder on uneven ground. It could also be caused by improper positioning of the ladder against the walls. • Inappropriate clothing: These kinds of clothing can catch on projections, causing the ladder and its users to topple sideways and fall. • Poor maintenance of the ladder: An improperly maintained ladder is a dangerous tool to use when cleaning your gutter as it could easily break. A wobbly ladder also should not be used when cleaning the gutters as they are quite unsafe for use. If as a homeowner you knew the proper way to clean out your gutter, then you could be safe from the above mentioned gutter cleaning dangers. How so, you may ask. Well, read on to find out. There are a quite a number of gutter cleaning tips that can be opted for so as to always be on the safe side. The below listed gutter cleaning tips are some of the best among them. It is recommended that you make another person aware that you will be utilizing a ladder to work on your building’s gutter or roof for safety purposes. That being done, you should use a sturdy and safe ladder that is properly maintained. The preferable type of a ladder when it comes to cleaning your gutter is the type that has a small strong shelf that can be able to hold a 5-gallon or so bucket to collect the debris from the gutter. The bucket however needs to be firmly secured with a strong wire or rope. Before getting started, make sure to examine the ladder for loose parts, defects or dents. The best type of garden hose to use for gutter cleaning undertakings is the type that comes with a pistol-grip trigger type of a spray nozzle, and for a good reason. This kind of a spray nozzle allows the user to adjust the water pressure to suit the immediate requirements with only one hand. Make sure to wear appropriate gloves to help protect your hands against rotting leaves and dirt debris that usually contains hidden bird and animal droppings that are ridden with disease causing bacteria. Apart from this, gloves are ideal for protecting against cuts from torn metal from the gutters. The most recommended types of gloves in this case are the thick, suede-made types as they are superior to rubber, cotton or thin leather varieties. Protecting the eyes is mandatory as you never know what might fly out of the gutter when cleaning. A lot of people have been stung by wasps or bees or even knocked off the ladder by rats, birds and other animals leaving the downspouts at high speed once the cleaning undertaking commences. Because walking on a building’s roof is a necessary part of cleaning the gutters in Toronto, it is advisable to consider wearing rubber-soled. These types of shoes adhere best on the surface being worked on, preventing slip as well as fall incidents. And while at it, walking on the roofs should be done after the sun is well up in the sky as doing so in the morning is quite risky due to moisture. Gutters Have A Role In Safeguarding Your Home! Spending a lot of time thinking about gutters does not solve any related problem that you may face. Instead, it weighs down on you and burdens you each day. Costly home repair bills are some of the things that many homeowners try to evade. Nonetheless, if you do not comprehend the core essence of gutters in your home you will not be in a position to fix any problem that rises early enough before there is extensive damage. Home sidings need protection from rainwater because rainwater damages it. Gutters come into use by funneling off rainwater from the roof. As a result, home foundation, windows, doors and walls do not get damages from rainwater. The level of damage will be high when there is clogging in the gutters not to mention leakages and breakages. This is very true because they cause gutters to function poorly. Rainwater ends up collecting on the ground near the foundation. Here are some of the ways through which the gutter keeps your home safe. When it rains heavily, ample water collects to the ground. Poor drainage at home is likely to worsen things because more water will collect close to the home and at the very point of foundation. Too much water culminate into floods that may end at home and the basement particularly. If water gets to the basement and you have valuable things there, it will cause damages beyond repair. Well-installed gutters prevent water from collecting at the basement and around the foundation of a home. It minimizes the possibilities of damaged property. Foundation is the core part of any building and even more essentially a home. In that regard, it has to be strong and highly durable. However, there are factors that may affect it and trigger high rate of deterioration over the course of time. 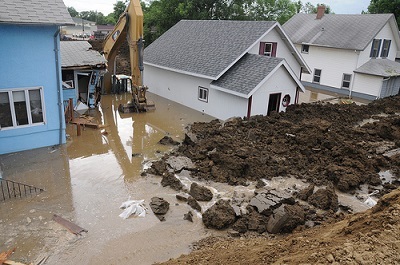 Too much rain for instance, affects the foundation of a home when it collects at the foundation. It slowly weakens it and eventually causes it to crack. Failure to take initiative to deal with the problem may spell big future problems. A gutter that functions to its best keeps the foundation free from rainwater as it channels it to the right drainage system. A good number of insects particularly mosquitoes make use of stagnant as a breeding ground. With time, they increase in number and cause all manner of infectious diseases. Some of the illnesses caused by them may be terminal in some cases. The gutter ensures that mosquitoes and other insects that take advantage of stagnant water get no breeding ground. By rightly draining water from the rain through the proper channels, the chances of having high infection rate goes down tremendously and the home becomes a safe place to live. Molds particularly flourish when the gutters overflow with water. It creates a suitable environment for them to thrive in the basements and crawlspaces. Good gutters do not easily overflow with water. In that case, the chances of having molds that thrive and spread like fire in the basement and crawlspaces become minimal. Debris and leaves that fall from trees and get carried by the wind ending up in the gutter are the key things that cause clogging if left for a long time. Occasionally, it is fair enough to clear the gutters in case there is any debris or leaves that may result in clogging and blockages. Clear gutters ensure water flow and put an end to flourishing molds. The foundation of your home does well for a long time when it has top soil that keeps it intact. Water flowing uncontrollably from poor gutter washes away the topsoil and leaves the foundation at a greater risk. Moreover, the water that drips off the leaking gutters ends up on the walls of a home causing great damage. It washes off part of the wall paint leaving it with unsightly look. To paint the wall again will require some money, which is another unnecessary cost. Perfect gutters fitted into the roof system ensure that you do not incur any cost due to damaged paint or eroded top soil that leaves your foundation vulnerable. Exterior building products that are mainly made of iron are more likely to rot and rust when exposed to water and air. Water that trickles through the leaks of spoilt gutters find their way to these product and cause damages that are costly to repair. Most undoubtedly, gutters play a unique role in keeping the home a good place to live while protecting the beauty of soffits and fascia. They drain water and keep the home habitable even in cold season. Regular cleaning and maintenance of the gutters will go a long way to help you cut down unnecessary costs and keep your home in a good condition. Gutters can be quite problematic sometimes, especially if the homeowner hasn’t inspected them in the last years. They can clog, they can develop leaks and cracks and they can pose a serious of problems that are quite expensive to repair. Luckily, if you take good care of your gutters from time to time, you can avoid major problems and save a lot of money in the long run. Here are a couple of common fixes to some of the most popular gutter issues you might encounter during your lifetime. Thanks to bad weather conditions and different types of debris such as small tree branches, pebbles and so on, gutters can develop cracks and leaks with the passing of time. However, you shouldn’t be worried that you need to completely replace your gutters because of this. You can simply buy gutter sealant which can be found at most hardware stores and costs a couple of dollars. This sealant is perfect for covering small holes and cracks in your gutters. If you have to deal with larger cracks then you might to use a patch in order to fix your gutters. Patching kits can also be found at hardware stores and they are inexpensive. You can use them to make a patch from metal flashing and repair your gutters, so that they don’t leak anymore. Well-installed gutters tend to be inclined towards the downspouts of your house, so that gravity can attract water down the drain when it accumulates in the gutters. The rule of thumb is to have a slope of about half an inch for each ten or eleven feet of gutter. In order to see if your gutters are properly pitched, make sure that you wait until it rains and then climb on a ladder to see if there is standing water in the gutters. If it is then your gutters do not feature the correct slope. 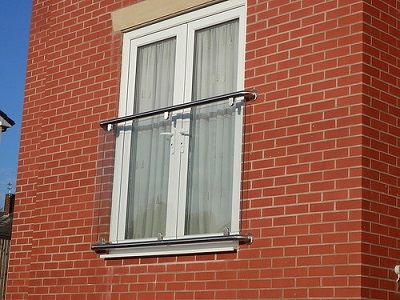 If you want to pitch the gutters by yourself then you can bend the hanger downwards or upwards, depending on the case, in order to create a small slope. Hopefully this will solve your problem, otherwise you might need to bend a little bit more, so that water drains properly. If you have seamless gutters then make sure that you call the guys who installed the gutters and speak with them about this problem. Another common problem homeowners encounter consist of sagging gutters or gutters which tend to pull away from the house. Well, in most cases the culprits for these issues are the hangers or the fasteners which are responsible for securing the gutters to the fascia. For example, the hangers might have been deteriorated with the passing of time or the fasteners might have been pulled out from the house walls. To fix this, all that you have to do is to buy several brand new hangers from a hardware store and a couple of fasteners. These items are very cheap and you can replace them by yourself when you have a free afternoon. Perhaps the most common problem consists of clogged gutters and this can be a serious one. It is highly recommended to clean your gutters at least once every year or maybe twice if you have a lot of trees nearby. Basically, leaves, bird feathers or tree branches can clog your gutters quicker and that’s why you should clean them more often. When it comes to gutter cleaning, you can either outsource this job to a professional company for a fair price or you can do it by yourself. In order to clean the gutters on your own, you need a stable ladder and a pair of protective gloves as well as protective goggles. In some cases, wasps or even small birds or rats can jump out from the clogged gutters and you need to be protected all the times. After you cleaned your gutters, make sure that you use the garden hose in order to flush everything out and see if water drains properly. To prevent further clogging, you might want to invest in protective meshes which are placed above the gutters and which prevent leaves, tree branches and other types of debris from accumulating into your gutters and cause blockages in the long run. These products are not that expensive and if you install them, you won’t need to clean your gutters that often. Hopefully these 4 simple fixes will be useful for you, but if you encounter a serious problem with your gutters, make sure that you give us a call. We have a lot of experience when it comes to installing and repairing gutters, and our services come at reasonable prices! Here Are 6 Exquisite Exterior Siding Options Available For Your Property! Adding exterior siding to your property is highly recommended these days as this is the best way to improve the aesthetics of your house, increase its value and insulate it properly, so that in the future you don’t waste a lot of money on your energy bill. Also, the good news is that there are many siding materials available for you to choose from these days. In order to make a fully-informed decision, here are more details about the most popular exterior siding materials you can find on the market. Vinyl is one of the best materials to go for if you don’t have a big budget to spend on home improvements, yet you want a quality product that can pass the test of time. Vinyl siding comes at affordable prices and it is available in many colors, giving you the opportunity to completely transform the exterior design of your house. Additionally, this siding option is very easy to maintain and it can last for a decent amount of time, so it is worth taking it into consideration. Additionally, if you are a DIY type of guy, vinyl siding is perfect for you as you don’t need advanced tools or a lot of time in order to install it on your house. Genuine brick comes in different sizes and textures these days, but it can be quite expensive to install. However, brick veneer is more affordable and it is perfect for you if you want to give your property a warm and attractive look. Brick veneer can also increase the lifespan of your property if it is installed correctly and it can protect it against bad weather conditions and other damaging agents. When the professionals install brick veneer, they will also install a waterproof membrane under it in order to prevent water from infiltrating and causing damage to the house. Although installing brick veneer is a little bit time-consuming, it will increase the value of your property and make it look gorgeous. In a similar fashion, you might want to take into consideration installing stone veneer on the exterior of your property. This material is lightweight and less expensive than genuine stone, so it can be installed quicker, easier and for less money. Also, especially if the stone veneer siding is properly maintained and cleaned on a regular basis, it can last for a lifetime. Another great advantage of stone veneer siding is that it comes in a variety of styles, colors and textures, giving you the opportunity to raise the curb appeal of your house without paying a fortune for this. This siding option is also very popular and commonly encountered in Mediterranean houses. Stucco is usually made from building sand, cement, limestone and water if it is properly installed and maintained from time to time, it can last for decades without problems. Before installing stucco, the professionals will a waterproof membrane and a galvanized-metal screening in order to protect the walls of the house and support the stucco which will be placed above it. Lastly, stucco comes at affordable prices, so it is within every homeowner’s budget reach. On the other hand, if you are attracted by the warmness and rich texture of wood then you might be happy to know that you can also use this material as exterior siding for your property. Although this siding option is a little bit more expensive, it will give a traditional and welcoming look to your house and it can even last for a hundred years, if it is maintained regularly. When it comes to maintenance, you might have to chalk and paint wood siding in order to prevent weather damage. Additionally, some manufacturers treat the wood siding in order to be more resistant to pest attacks as well as fires. If you want to sleep better at nights, you are strongly encouraged to go for such quality wood siding in the future. The last one in our list is fibre-cement siding, an increasingly popular siding option that comes at a reasonable price these days. This siding option doesn’t require a lot of maintenance and best of all, it is fire-resistant. Therefore, you have the assurance that your house will not be affected if a leaf catches fire by accident in your yard during a hot summer day. Similarly, fibre-cement siding is termite-resistant as well. Needless to say, fibre-cement siding comes in a plethora of designs, textures, colors and finishes and you should take advantage of this in order to give your property that beautiful and attractive look you have always wanted. Another good siding option would be aluminum siding and if you are interested about its benefits and features, make sure that you give us a call. We have a lot of experience when it comes to exterior siding and we can help you make the best choice.